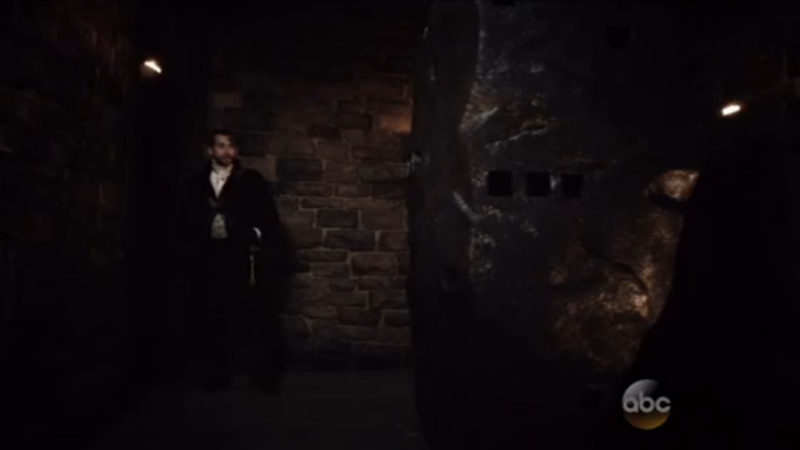 The episode starts with the oldest flashback we’ve seen, showing the monolith in an old castle circa the 19th century. It’s kind of interesting to see this far back, but it really doesn’t amount to much in the grand scheme of things. Perhaps some future episodes will continue this trend in a new direction, though. Basically all we learn here is that Simmons is far from the first to end up at that alien planet–and no one has ever returned. Except this is TV and Simmons is a main character, so there’s no question as to whether she will be rescued; merely the “how?” remains. Using the dust as a clue to the monolith’s function is a pretty clever trick, but having it activated by vibrations seemed a little too convenient. Oh, look, it turns out that our one and only superpowered team member has exactly the right superpower to save the day! 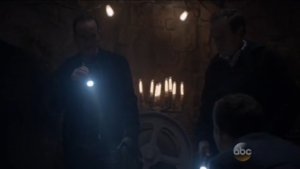 And I think we all knew Fitz would jump in himself as soon as it was activated, so that could’ve been avoided. As far as the whole monolith plot goes, it’s pretty clear to me that this is one of these incidents that SHIELD handles so well, where the event itself isn’t half as important as the aftermath of the event. 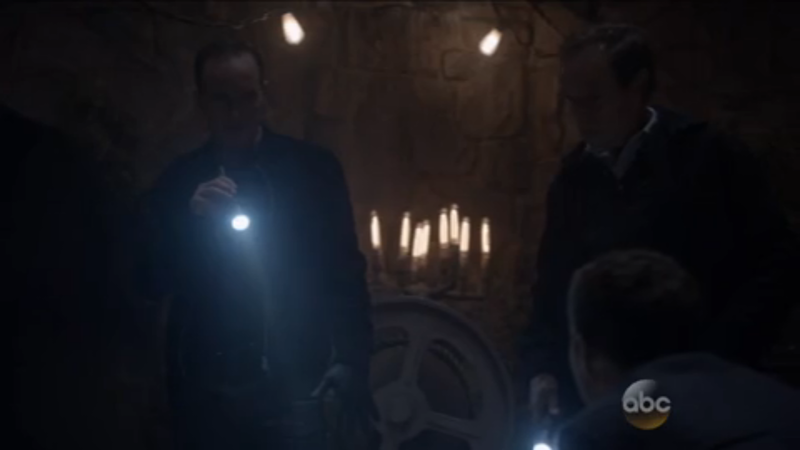 Skye/Daisy’s slow development of powers, Coulson’s alien compulsions, etc. So in that regard I’m willing to forgive some of the hasty writing to get this over with if it means we get into the meaty part of the story sooner. Although I gotta say, I’d never have guessed we’d see Elliot, the Asgardian from Season 1’s Thor 2 tie-in episode “The Well” again. It was a great way to make use of what was already established, but he could’ve been put to more use throughout. If it seems like I’m a little disappointed, it’s because I was hoping they’d end up sending an expedition through and spending a little more time on the alien world. As it is, we didn’t see much of it and still have no idea where it is or how it’s important. That may have been too much to hope for, but it’s just the feeling I got from the last episode. I guess the big question now is, who built that chamber under the castle, and why? Does this look like the heir to HYDRA? …Actually yeah, kinda. That’s okay, though, because there’s other stuff going on. May hasn’t just skipped town, but rather is staying home to help her father recover from a hit and run… of which she suspects Ward was responsible. Hunter tracks her down and tries to talk her into going after Ward together, because he was a huge dickbag last season and someone needs to do something about that before HYDRA starts to be a problem again. Her father ends up pushing her into getting back on her feet again by using literal examples of times that she fell down as a kid, particular this whole ice skating thing, which seems like one of the least practical sports to play in Arizona. Her ex-husband, meanwhile, is still around at base, helping to appraise the condition of their new Inhuman recruit from last week. He’s overcautious, much as before, but with powers as uncontrollable as that guy’s, it doesn’t hurt to be. It’s nice to see that Garner will still be around, as his appearances last season were well done and if any team needs some regular counseling, it’s this one. Unfortunately, it looks like his insistence on not rejoining SHIELD might come back to bite him, as it provides an opening for HYDRA. Ward spends most of the episode having a snotty rich kid tortured, and it turns out this kid is Werner Von Strucker, son of Baron Von Strucker from Age of Ultron and a character who was the subject of much discussion in the lead-up to that film’s release, largely since the Baron is a WW2-era character in the comics. Interestingly, as you can see on the Wiki, Werner in the comics has ties to a number of villains and characters we’ve seen already or will see soon, like the Punisher, Kingpin, and of course, his father. The Werner in SHIELD has no real knowledge of HYDRA, which puts him on a different level than his comics counterpart, but given his apparent streak of viciousness, I wouldn’t be at all surprised to see him snatching HYDRA out from under Ward. He’s definitely got a big role in what’s coming, so it should be interesting to see how they utilize the character.